and they're not giving it back. Years ago my daughter dug out a tiny mudhole in our backyard. At dusk, I sit at its edge, opposite the pokeweed I am learning to like, under a stray white birch I have always liked. Boy lightning bugs arise from the earth, flashing their "J"'s, looking for love. I read until the dusk chases words off the page, my feet resting on a small stone wall we built together. I have been reading Tolstoy's Resurrection, published well over a hundred years ago. Leslie found it sitting at a curb in a box full of books with a sign urging folks to take as many as they'd like. The box stayed mostly full. Late 19th century novels are best read outside. The world of Tolstoy does not differ much from ours once outside. People haven't changed much since then, despite the horrors committed in our 20th century. Tolstoy gets a little preachy in this one, railing against the false abstractions fostered by the justice system and by the church. His descriptions of the natural world bring the reader back to what is real, and true. We've lost many of our children to an artificial world we've created. Important people keep trying to sell us more and more of this neat world, with tidy boundaries and finite worlds. Cell phones,digital cameras, iPods, television, personal computers, and, of course, personal digital media players--PDMPs. According to Business Wire, kids on average start to use PDMPs at age 9. Parents want what's best for their kids without knowing what's best for themselves, a marketing dream for the high courts of technology. Our children are losing touch with the natural world, and we're encouraging it. The high tech education gurus will put you back in touch with "nature," safely. kidthing is one such company. Lower case "k", kute, eh? kidthing delivers the next generation Internet-based learning environment through its proprietary distribution, publishing and social networking platform. kidthing provides a safe, ad-free, global learning environment that insulates children from the World Wide Web. It also insulates children form the world, period. Don't worry, though, the kidthing trademark is a lovely, digitized lady bug next to a, um, deformed clover? Parents can preview and purchase learning and entertainment content, create custom mixes of kidthing and personal content and make their children the “star” with content that can be personalized. We are creating artificial universes with artificial centers. Galileo spent the last few years of his life confined to his home, having dared demonstrate that Copernicus was right, the universe did not revolve around the Earth. Turns out Ptolemy was mostly right after all--the universe turns around your child. Many parents believe this. Leo Tolstoy's Resurrection tells the story of one man seduced by the cultural artifice of his time leading to disastrous consequences for others, and himself. The world is bigger than all of us, and centers around none of us. It is incomprehensibly large and unimaginably diverse. It cannot be found in a box on a desk in a room, no mattered how wired it is. Leo Tolstoy knew this back in the 19th century. We haven't gotten any wiser since then. I don't have a particular thing against kidthing--the company happened to come up when googled. It is fitting, though, that Larry Hitchcock, the CEO, cut his teeth over at Pearson Digital Media. Pearson is one of many companies looking to pocket some change from Arne's folly. 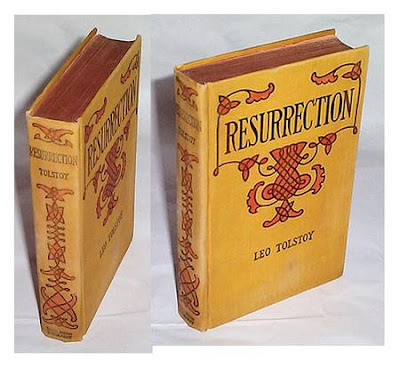 The photo of a 1st American printing of the 1st edition of Resurrection comes from Biblio.com. I love reading Tolstoy. Master and Man left a mark on me. I know he was a hypocrite and he was incredibly flawed and all of that, but I think that's part of what draws me to his writings. We don't let our kids play with video games or much of anything that beeps and buzzes. Still, our youngest son Micah played with an old cell phone. He walked around the house saying, "smile" and pretending to text. At first I laughed and then it made me really depressed. None of us are perfect, though a few imperfectly view themselves as nearly so, and I trust Tolstoy recognized a good chunk of his own hypocrisy. Children will, of course, play games of whatever kinds are available. Children mimic what we do, and help expose our own errors, as they have since children have been around. I am tickled to know you love Tolstoy's words--you once wrote many moons ago something about how we're likely to be two very different people with opposing views, and they may well still be true. It's fun to see where interests intersect.